If you have created a design why not transfer it onto a t-shirt or any other item of clothing using our t-shirt press? The t-shirt press here at FabLab @ The Word is the Clam Shell T-shirt Press. You can use our t-shirt press alongside our vinyl cutter to make your own designs and then transfer them onto an item of clothing. The t-shirt press is the final stage of the process for creating customised clothing and once the vinyl has been created, the t-shirt press can be heated up and the vinyl can be placed and transferred onto the item of clothing. 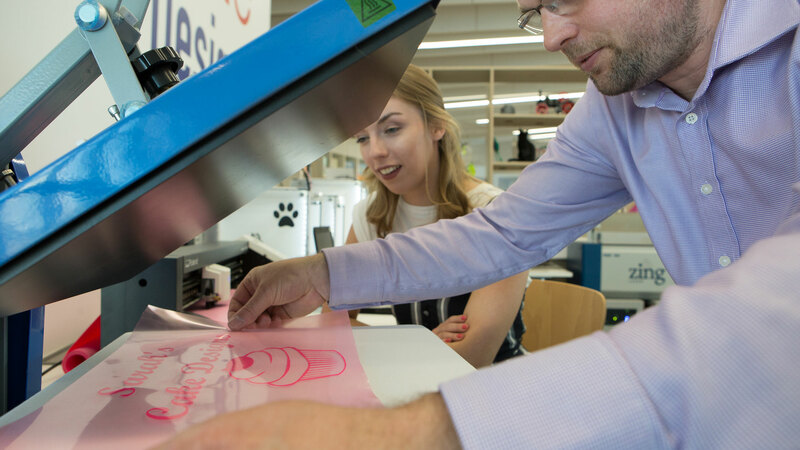 Whether you’re a business wanting to make branded t-shirts for staff, a group who want personalised t-shirts for a special event, or if you just want to customise your own clothes then visit our FabLab and have a go.